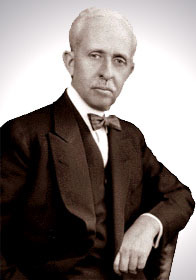 Opening his first department store on April 14, 1902, J.C. Penney went public in 1927, giving all his store managers shares and later including all his employees in corporate profit-sharing. By 1971 J.C. Penney’s had 1660 stores in North America. A devout Christian—he published 50 Years with the Golden Rule (1950)—he gave generously to his favorite charities, establishing a 120,000 acre scientific farming community in Florida, the Memorial Home Community, a 60-acre residential community for retired ministers, lay church workers, missionaries, their wives and families, and the J.C. Penney Foundation to assist religious, scientific and educational projects. In 1954 he established the James C. Penney Foundation to support organizations addressing issues of community renewal, the environment, and world peace. In 1957, Penney became a charter member of the Distributive Education Clubs of America, helped found and funded Junior Achievement Clubs, and endowed a chair at Westminster College in Missouri. A few years before his death he donated his Guernsey herd and a large endowment to the University of Missouri for the support of improved dairy farming. Penney was a life-long Freemason, being Initiated into Wasatch Lodge No. 1 Free and Accepted Masons of Utah, on April 18, 1911. He was also a 32nd Degree Scottish Rite Freemason. One of the State of Wyoming's only non national park-related claims to fame: His first J.C. Penney stores were started here in Wyo, and the first ever, located in tiny Kemmerer, WY, is still operating.